The bolts of The Morris Garden fabric should be in the quilt shops any day now. If you are looking for pattern ideas I'd suggest a simple sawtooth star. Set it with alternate blocks of large-scale fabric and turn it on point. It's a great way to show off complex fabrics. If you made stars that finish to 9" you could use a package of Moda's Layer Cakes (fabric precut to 10" squares) for the alternate squares. It's also an authentic pattern for an early reproduction quilt to feature chintzes and toiles. 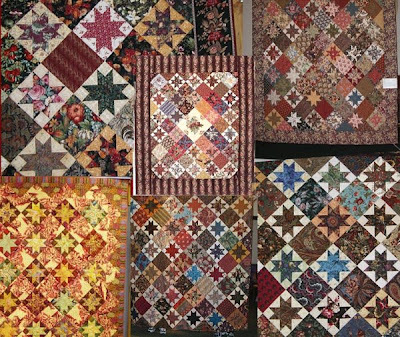 Click on the links below to see three early versions from the International Quilt Study Center and Museum at the University of Nebraska Lincoln. Roseanne says: You have given me too much credit. I did make the star in the bottom right corner. But the other two you credit me for are not mine. I think the upper right one is either Janet Perkins's or Wendy Turnbull's. I only remember that I loved that border and wished I had used it. Star quilts are my absolute fav'! I'm waiting (impatiently) for my order of the Morris Garden fabs to arrive! GREAT idea! I suppose I better order in some layer cakes! :o) Have a great day!